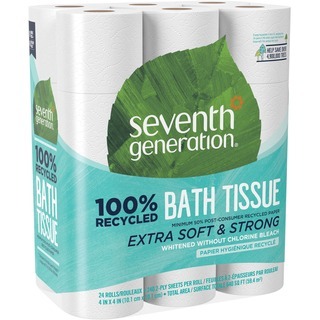 Soft, Recycled Bathroom Tissue makes it easy to lessen your environmental impact. It is made with a high percentage of post-consumer content, and buying products made from recycled paper reduces the need for virgin wood pulp so more trees are left standing. Bathroom tissue is whitened without chemicals containing chlorine. It has no added dyes or fragrances. Two-ply construction provides strength. Each roll contains 240 sheets.